When Sara Pezzini discovered she was with child, she did not know who the father was, or even how she became pregnant. It soon became clear that her unborn child would be pivotal to the Top Cow Universe when the forces of The Darkness and the Angelus moved to take possession of the baby. First Born Volume 1 collects First Born #1-3 along with Witchblade #110-112. 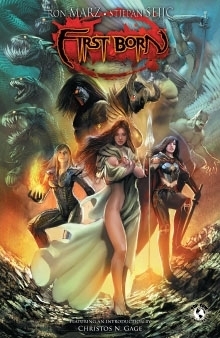 Written by Top Cow architect Ron Marz (Artifacts) and Stjepan Sejic (Witchblade) and featuring art by the industry’s finest artistic talent. Also included in the volume is a cover gallery, behind the scenes sketches, designs, and an introduction by Christos Gage! First Born Volume 1 is available now at DriveThruComics.com. First Born: Aftermath One Shot – You only thought FIRST BORN was over! Coinciding with the release of the FIRST BORN collected edition, a pair of all-star creative teams joins forces for two tales that pick up very literally from the ashes of First Born, and set the stage for coming events in the Top Cow Universe in this oversized special. First Born: Aftermath One Shot is available now at DriveThruComics.com.